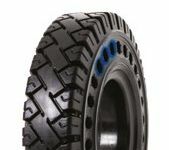 Unique SOLIDEAL MAG 2 aperture design with specially engineered core construction for longest life.Damage resilience of a solid tyre with a ride similar to an air-filed tyre. Designed to reduce vibration transfer to the forklift, to the load & to the operator with improved rolling resistance. Excellent for driver comfort (less fatigue) and maintaining good floor quality for tilt-slab warehousing operations. NEW 16.00-25 SOLIDAIR MAG2 due for release 2014!